Eating Healthy on a Budget can be tricky but if you meal plan properly you can take most of the guesswork out of your grocery bill – enjoy these cheap dinner ideas to get you started! With all the cheap frozen dinners out there I know it can seem really hard to eat healthy on a budget. As a former student who used to eat ALL her meals at home, I feel especially qualified to write this post on eating healthy on a budget. I really knew how to make my dollar stretch in the grocery store and hopefully you'll get a few handy tips from me here. Believe it or not I used to be able to eat on $30-50 a week and I was pretty good about sticking to this budget! Keep reading to find out how you can eat healthy but still save on your grocery bill. Opt for cheaper protein sources like lentils, chickpeas, beans, eggs, quinoa & tofu – even one or two meatless meals per week can save you tons of money! Shop for pantry staples like oils, vinegars, condiments, sauces, etc. at your local discount grocery store – in Canada we have stores like Price Chopper & Food Basics where you can save up to a dollar or two on the exact SAME condiments like ketchup, soy sauce, olive oil, etc. When you're running low on these staples stock up! Buy meat when it's on sale and freeze it – you usually have 3 or more months to eat it up so if you have the storage bulk in bulk! Of course meal planning is absolutely integral to eating healthy on a budget so it's one of the top ways you can save money. You need to stay organized and really commit to grocery shopping on a budget and that involves planning out easy, quick recipes that don't use a ton of fancy, expensive ingredients. It's super easy to write out a meal plan if you can commit to doing it on a certain day of the week. I always do mine on Sundays; I sit down and take a look at my social calendar and then plan the recipes I'm going to make accordingly. 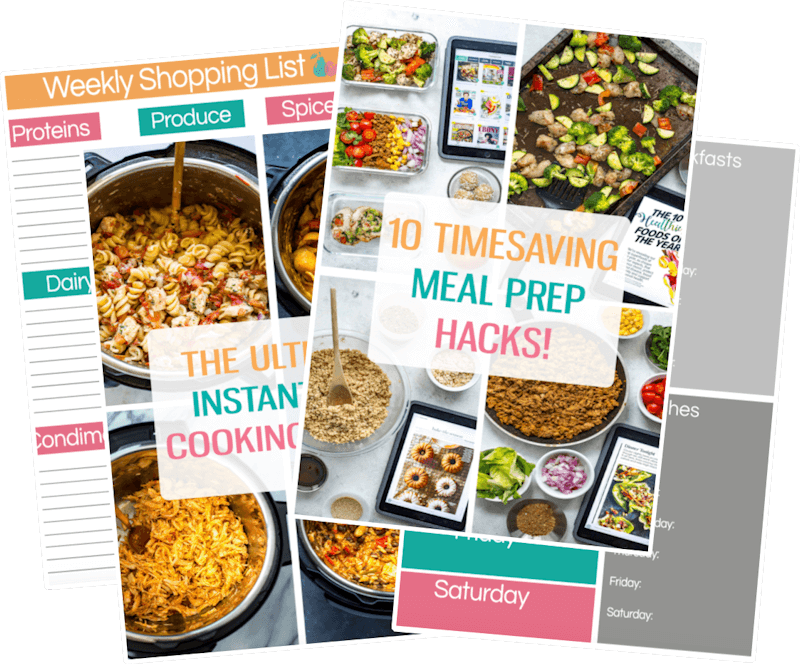 If you want to plan out your meals like I do, you can download my FREE WEEKLY MEAL PLANNER HERE (along with a grocery list and other meal prep resources) to keep yourself organized! It's also helpful to take a look through your fridge to see what you already have on hand so you don't buy double what you need or don't use up what's going to go bad. 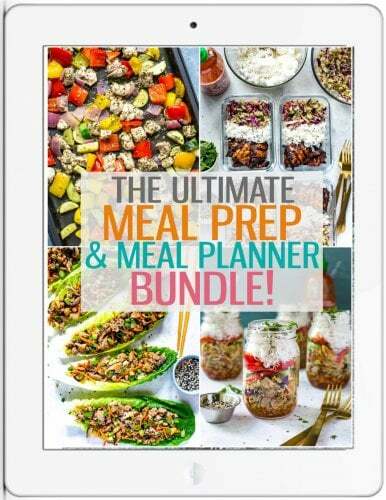 Download your free meal planner HERE. Now for those tasty cheap recipes! I promise you can make budget meals that still taste amazing and these recipes are proof! Sheet Pan Greek Chicken – just add veggies and a marinade made from your spice drawer! Sausage Peppers and Onions Skillet – the formula is simple: just add any veggies you have on hand to this skillet! Loaded Sweet Potato Fries – use a bag of frozen sweet potato fries, then add veggies and a can of black beans. Done! Zucchini Pizza Boats – Add whatever veggies you have on hand plus tomato sauce and cheese. That's it! Italian Chicken Skillet – you should already have all the seasoning ingredients in your pantry! Instant Pot Egg Roll Bowls – Just a bag of coleslaw, a pound of ground chicken and some mushrooms, that's it! Looking for more meal prep recipes and resources? You'll love these other posts – they'll help you eat healthier, tastier food on a regular basis! BONUS: DOWNLOAD ALL MY FREE MEAL PREP PRINTABLES HERE!